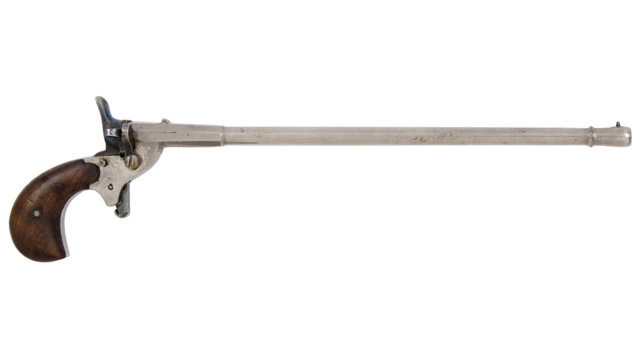 Our Winter Firearms and Accoutrements: Timed Online Auction features an assortment of firearms, militaria and accoutrements including powder flasks, pinbacks, bayonets, swords, cavalry and uniform regalia. Bid early and bid often! There will be a Buyer's Premium charge of 20% added to the final price of each item sold in this timed auction. Special Collections items are available for absentee bidding only. You can browse the catalog and place bids at any time. This platform operates using the "proxibid" method - you may place a high bid and the system will bid on your behalf up to that limit. Starting at 12:00 PM (Noon) on the Final Date, all lots will close starting with lot #1. There will be a 1 minute period between each item until all items close. Any bids placed within 5 minutes of the closing time will extend bidding by another 15 minutes. This rule will apply continuously until no bids are placed within the 5 minute period. You will receive an invoice from Cowan's home office, detailing the hammer price, a buyer's premium charge, sales tax (for Ohio residents) and a shipping quote. To schedule a payment, contact us at payment@cowans.com, or call our office at 513-871-1670.